A rash of police shootings has escalated the tensions between the Gotham City Police Department and local street gangs. 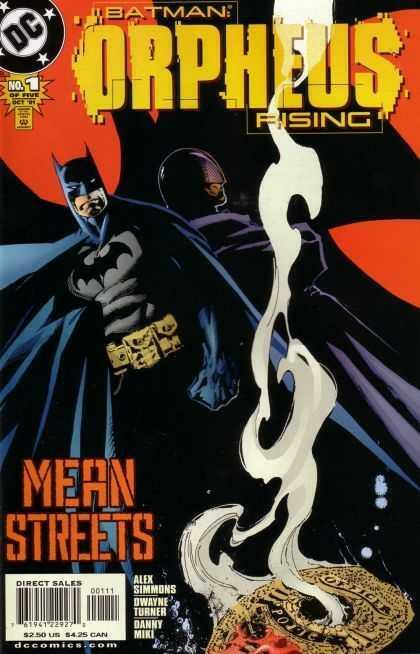 But as Batman investigates the shootings, he discovers more than just trigger-happy gangbangers. There’s a new costumed figure in town. But is this stranger a hero or a villain? Just who is Orpheus, and what is his connection to the shootings? Commissioner Gordon is gone and young black police officer Akins is left in charge of the precinct. Race related cop deaths are occurring everywhere across Gotham. The clues leave both oracle and Batman confused and directionless. Robin catches a glimpse of a mysterious figure that vanishes much the same way batman normally does. The more volatile police officers use the police deaths to victimize local gangs and race gatherings. Things look very bad. The case breaks when the police get a mysteries tip off, they stake out the building and find Orpheus laying waste to the criminals. Unfamiliar with this new hero they point their guns at him. Great Mystery! And great reveal at the end! Gothams problems flow logically especially with reference to the recently ended “no man’s land”. Tensions are high and this is conveyed well. My interest in the character of Orpheus is piqued since he is clearly skilled in much the same way as the batman family. Is he friend or foe? The depiction of Batman, Robin and Oracle were spot on accurate and the mystery posed a real challenge for two of the biggest brain in the dc universe. Alex Simmons tale is engaging from the very first page. I also enjoyed every panel of line work by Dwayne Turner. Great cover art depicting Batman shadowed by our new hero. Purists will complain of the same things which made Black Panther #1 “bad” the titular character feels like a guest in his own book. Scarcely any action in this issue. Young Justice Episode 4- Aqualad is the official leader!